There are millions of fungal species, and those few hundred found in the Aspergillus genus play important roles in areas ranging from industrial production to agricultural plant pathogens. Reported October 22, 2018, in Nature Genetics, a team led by scientists at the Technical University of Denmark, the U.S. Department of Energy (DOE) Joint Genome Institute (JGI), a DOE Office of Science User Facility, and the Joint Bioenergy Institute (JBEI), a DOE Bioenergy Research Center, present the first large analysis of an Aspergillus fungal subgroup, section Nigri. All Aboard the Jungle Express! In the quest to find the key to a rainforest dwelling bacterium’s lignin-degrading ability, researchers at the Department of Energy (DOE)’s Joint BioEnergy Institute (JBEI) have constructed a gene expression system that outperforms conventional systems. Controlling gene expression is crucial to scientists’ ability to perform basic science and biotechnological research to produce enzymes, bio-based products, and biofuels, both at the bench and on industrial scales. The JBEI team was led by Michael Thelen, a biochemist in the Deconstruction Division, and included researchers from Lawrence Berkeley National Laboratory (Berkeley Lab), Lawrence Livermore National Laboratory (LLNL), and San Francisco State University. Their work, published on September 6 in Nature Communications, describes the bottom-up engineering of Jungle Express, a versatile expression system that enables efficient gene regulation in diverse gram-negative bacteria. The researchers performed a combination of computational analysis and rational molecular engineering approaches to develop, understand and optimize performance of Jungle Express. This system encompasses several qualities that are very desirable in gene expression applications: tight control, high level and specificity of gene expression, versatility of host bacteria (from E. coli to industrially relevant strains), cost-effectiveness, and flexibility. To further characterize the system at the molecular level, Jose Henrique Pereira, a research scientist in JBEI’s Technology Division, performed X-ray crystallography at the Advanced Light Source, a DOE Office of Science User Facility. Using these data, they determined the interactions between the regulatory elements and two molecules, including crystal violet, used to turn on the system, which gives insight into its specificity. JBEI is a DOE Bioenergy Research Center funded by DOE’s Office of Science, and is dedicated to developing advanced biofuels. Other co-authors on the paper are: Joseph Chen, Andy DeGiovanni, Giovanni Tomaleri, Steve Singer, Nathan Hillson, Blake Simmons, and Paul Adams of JBEI and Pavel Novichkov and Vivek Mutalik of the Environmental Genomics and Systems Biology Division at Berkeley Lab. Read more about this research in the LLNL press release. The Pretreatment and Process Development Team at JBEI has been awarded the Secretary of Energy’s Achievement Award. The award is designed to recognize the contributions of Department of Energy (DOE) employees to the mission of the Department and to the benefit of the United States. The JBEI team was recognized for pioneering the development of biomass-derived ionic liquids (“bionic liquids”) to enable one-pot conversion technologies that are efficient, feedstock flexible, scalable, and economically viable to support production of biofuels and co-products. The team members honored by this award are Tanmoy Dutta, N.V.S.N. Murthy Konda, Corinne D. Scown, Blake A. Simmons, Seema Singh, Aaron M. Socha, Jian Sun, and Feng Xu. This team is a model of inter-institutional collaboration that JBEI has enabled, with about half of the team having been affiliated with Sandia (Dutta, Singh, Socha, Sun, and Xu) and the other half with Lawrence Berkeley National Laboratories (Konda, Scown, and Simmons). The members have worked together to advance cellulosic biofuels research and development by increasing the economic and environmental sustainability of biomass pretreatment. The bionic liquid-enabled integrated one-pot process reduces annual operating cost by 40 percent and water use/waste water generation by approximately 85 percent, and has the potential to reduce greenhouse gas emissions by as much as 50 to 85 percent compared to conventional gasoline. With clear economic and environmental benefits, the one-pot bionic liquid process may represent a breakthrough technology in the cellulosic biofuel development. 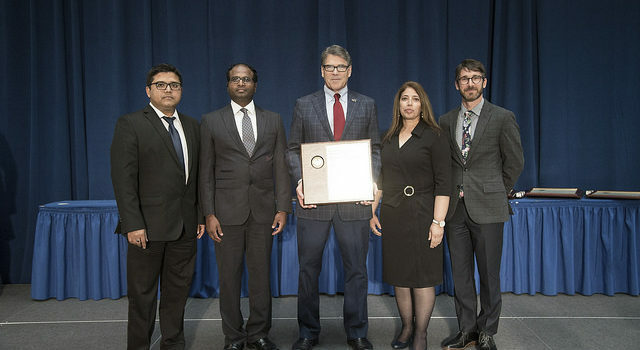 Dutta, Konda, Singh, and Socha received the award on behalf of the team from Secretary Perry at the ceremony held on August 29 (pictured above from left to right with Secretary Perry in the center). For more information about the ceremony, please see the Department of Energy announcement. Some chemicals used to speed up the breakdown of plants for production of biofuels like ethanol are poison to the yeasts that turn the plant sugars into fuel. Researchers from the UW-Madison-based Great Lakes Bioenergy Research Center, Joint BioEnergy Institute, and several Department of Energy National Laboratories have identified two changes to a single gene that can make yeast tolerate the pretreatment chemicals. They published their findings recently in the journal Genetics. Sugarcane was the last major cultivated plant to have its genome sequenced. This was because of its huge complexity: the genome comprises between 10 and 12 copies of each chromosome, when the human genome has just two. An international team which included JBEI coordinated by CIRAD achieved this milestone, as reported in Nature Communication on July 6. It will now be possible to “modernize” the methods used to breed sugarcane varieties. This will be a real boon to the sugar and biomass industry. In a study published ahead the week of January 8, 2018 in the Proceedings of the National Academy of Sciences, a team led by researchers at the Technical University of Denmark (DTU), the DOE Joint Genome Institute (JGI), a DOE Office of Science User Facility, and the DOE’s Joint BioEnergy Institute (JBEI), led by Lawrence Berkeley National Laboratory (Berkeley Lab), report the first results of a long-term plan to sequence, annotate and analyze the genomes of 300 Aspergillus fungi. These findings are a proof of concept of novel methods to functionally annotate genomes in order to more quickly identify genes of interest. A new study led by researchers at the Department of Energy’s Joint BioEnergy Institute (JBEI), based at Lawrence Berkeley National Laboratory (Berkeley Lab), demonstrates the importance of microbial communities as a source of stable enzymes that could be used to convert plants to biofuels. The study, recently published in the journal Nature Microbiology, reports on the discovery of new types of cellulases, enzymes that help break down plants into ingredients that can be used to make biofuels and bioproducts. The cellulases were cultured from a microbiome. Using a microbial community veers from the approach typically taken of using isolated organisms to obtain enzymes. JBEI’s Feedstocks Division collaborated with Sandia National Laboratories in a study that looked into efficient ways to turn discarded plant matter into chemicals. A paper by JBEI researchers has been ranked among the top 10% most cited PLOS ONE articles. “A Thermophilic Ionic liquid-tolerant Cellulase Cocktail for the Production of Cellulosic Biofuels” published in 2012 has already been viewed 8,871 times and cited 50 times as of today. The paper reports the development of an Ionic Liquid-tolerant cellulase cocktail by combining thermophilic bacterial glycoside hydrolases produced by a mixed consortia with recombinant glycoside hydrolases.